This review first ran in the Feb. 25 edition of The Hamilton Spectator. So why is good help so hard to find? We’ve all heard this story before. A company needs to hire because business is booming, Boomers are retiring or someone’s moved on. The job posting goes out and the flood of resumés come in. But there isn’t a single applicant who fits the bill. No one has the requisite skills, the job goes unfilled and the search continues, both for the company that urgently needs to hire and the freshly minted grads, the under- and unemployed who desperately want to get hired. According to conventional wisdom, an ever-widening skills gap is to blame. Companies complain that schools fail to deliver the right training and allow students to graduate unskilled. The government takes heat for not welcoming enough skilled immigrants and foreign-trained professionals and job candidates are blasted for having unrealistic expectations when it comes to pay, perks and benefits. Peter Cappelli doesn’t buy it. 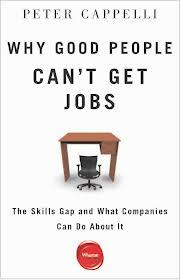 The Wharton School professor and author of Why Good People Can’t Get Jobs says when he looks at the facts, there’s no solid evidence to support claims of a skills gap. While there’s a definite disconnect between workers and jobs, blaming the victim misses the mark and only makes matters worse, warns Cappelli. Cappelli also calls out hiring processes, especially at companies using cost-saving, HR-shrinking and applicant-crunching tracking and screening software programs. The problems begin with the unrealistic expectations of hiring managers who are, as the founder of a staffing company puts it, looking for unicorns. “Managers pile all the credentials and expertise into the job description to minimize the risk that the candidate will fail, making it virtually impossible to find anyone who fits,” says Cappelli. Once it’s baked into the software, every requirement, no matter how critical or trivial, becomes a hurdle that applicants must clear to get an interview. Not surprisingly, few candidates survive the process, regardless of their experience and ability to do the job. Cappelli concludes his book by saying what we’re really facing is a training gap. “Despite all the concern about the supposed inadequate skill level of job seekers, surprisingly little attention has been paid to the sagging investment in employee training among those companies apparently desperate for skills. In-house, employer and employee-shared training programs and traditional apprenticeships would go a long way to filling vacant jobs and putting people to work, says Cappelli. Mechanical Devices set up a 10-week training program to create its own machinists. Out of the first group of 24 trainees, 16 graduated and moved into the vacant jobs. In challenging conventional wisdom, Cappelli has written a book that will save employers from searching for unicorns and make good help far easier to find and hire. This review first ran in the Feb. 11 edition of The Hamilton Spectator. My Feb. 11 hour 3 interview (35 min mark) with Bill Kelly on CHML 900 is posted here. Welcome to Diatribe Partners, Hamilton’s premier consulting shop specializing in social media smackdowns. Got a local politician, member of the Fifth Estate, business or community leader who doesn’t share your view of the world? We’re here to help. We custom-build campaigns to shame, silence and grind your enemies into submission. At Diatribe Partners, we don’t cast aspersions. We destroy reputations. Dissatisfaction guaranteed. A winning combination of snark and self-righteous indignation will fire up and unleash the fury of real and fake Facebook friends and Twitter followers. We’ll enlist the help of local hit-happy and traffic-hungry social media power users to recycle a steady diet of mis- and disinformation. Together, we’ll blindside and bury your enemy with a barrage of well-timed tweets and posts crafted to be as viral as they are toxic. We’ll bait your besieged and frustrated target into saying something regrettable that can and will be used against them over and over again in the court of public opinion. We’ll manufacture online conflict and controversy that stands a good chance of generating offline coverage in the mainstream media. And should your foe fight back, we’ll take a slight detour to the high road. We’ll claim only to be interested in having an impassioned constructive conversation and giving voice to the common people. 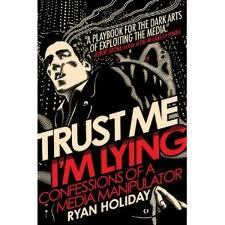 Here at Diatribe Partners, self-confessed media manipulator and online hit man Ryan Holiday is our patron saint. And Holiday’s expose — Trust Me, I’m Lying — is our playbook. Those tactics and consequences can be ugly. “Online lynch mobs. Attack blogs. Smear campaigns. Snark. Cyberbullying. Trial by comment section. It is clear to me that the online media cycle is not a process for developing truth but for performing a kind of cultural catharsis,” says Holiday. And then there’s the predominance of snark and sarcasm in social media. People say online what they would never have the courage to say face-to-face. “There is a reason that the weak are drawn to snark while the strong simply say what they mean,” says Holiday. “Snark makes the speaker feel a strength they know deep down they do not possess. It shields their insecurity and makes the writer feel like they are in control. Snark is the ideal intellectual position. It can criticize but it cannot be criticized. Holiday argues that you can’t have your news instantly and have it done well. That you can’t have your news reduced to 140 characters or less without losing large parts of it. And that you can’t manipulate the news and expect it won’t be manipulated against you.